Move over Rockefeller Center. Lower Manhattan has a dazzling holiday attraction of its own, and it's quickly become a new classic. Returning for its second year, Luminaries is an expansive canopy of 650 LED lanterns illuminating the Winter Garden at Brookfield Place. 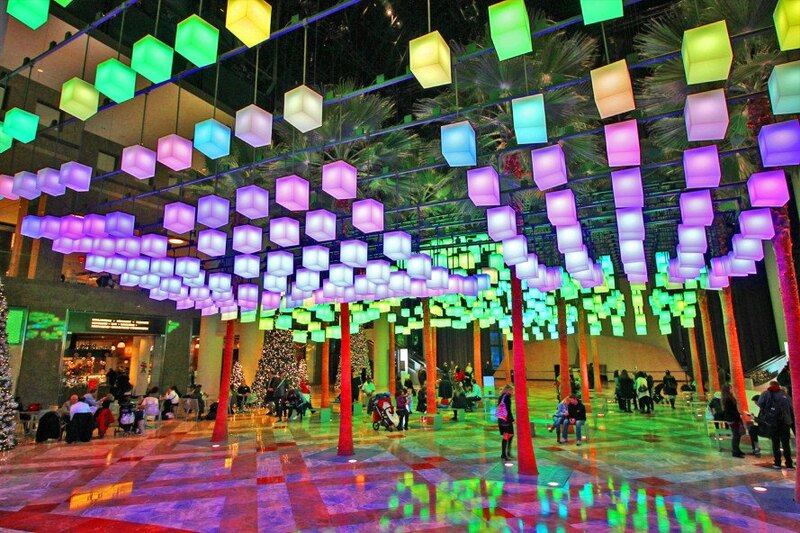 Presented by Arts Brookfield and designed by Rockwell Group, the mesmerizing display is also interactive, and invites visitors to make holiday "wishes" by touching select lanterns, resulting in an eruption of color that pulsates throughout the entire canopy. Read on to see a video of Luminaries in action. But Luminaries isn’t just be a killer selfie spot. The “wishes” made by guests will also spread the giving message of the season by raising money for The Grammy Foundation’s Grammy Museum. Arts Brookfield has pledged to donate $1 for each wish made on the canopy (up to $25,000). In order to make a wish, visitors can go to one of three wishing stations and wait for the cube to light up in their favorite color. Then they can make a “wish” by holding onto the cube for several seconds, which will then activate a ripple of the chosen color to spread through the canopy. LAB, Rockwell Group’s interactive technology studio, drew inspiration from traditional wishing wells for their concept. Thanks to its LED technology, the stunning display is fully programmable and is able to glow in an endless combination of colors and sequences. Guests to the Winter Garden can see this capability in action if they visit at the right times. Through January 8th, special holiday-themed light shows are scheduled for every 30 minutes beginning at 8 a.m. and ending at 10 p.m. daily. Luminaries will be open through January 29, 2017 from 8:00 AM – 10:00 PM at the Brookfield Place Winter Garden located at 230 Vesey Street in Manhattan. But Luminaries isn't just a killer selfie spot. But Luminaries isn't just be a killer selfie spot. The "wishes" made by guests will also spread the giving message of the season by raising money for The Grammy Foundation’s Grammy Museum. Arts Brookfield has pledged to donate $1 for each wish made on the canopy (up to $25,000). Then they can make a "wish" by holding onto the cube for several seconds. The "wish" will then activate a ripple of the chosen color to stream through the canopy. LAB, Rockwell Group's interactive technology studio, drew inspiration from traditional wishing wells for their concept. Thanks to its LED technology, the stunning display is fully programmable and is able to glow in an endless combination of colors and sequences. Guests to the Winter Garden can see this capability in action if they visit at the right times. Special holiday-themed light shows are scheduled for every 30 minutes beginning at 8 a.m. and ending at 10 p.m. daily. Luminaries will be open through January 29, 2017 from 8:00 AM - 10:00 PM at the Brookfield Place Winter Garden located at 230 Vesey Street in Manhattan.